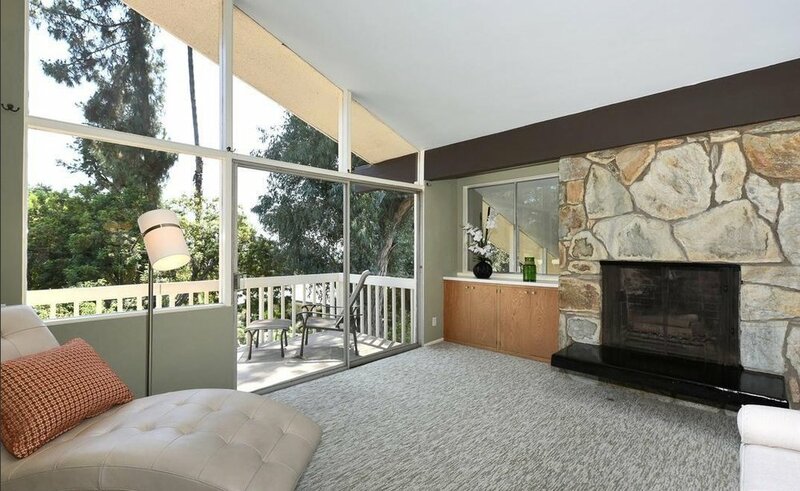 Only a stone's throw away from the breathtaking beauty of Angeles National Forest, this residence is a quiet, light-filled haven in the Mid-century style. Designed by Nyberg & Bissner Circa 1961, it is an entertainer's delight, with productive fruit trees and an ideal layout for hosting memorable days and evenings of fun. The expansive driveway at the end of a cul-de-sac provides ample parking for you and your guests, including two covered spots to keep your vehicles cool and comfortable. Soaring windows and a vaulted ceiling maximize the airy feel of the family room, which includes space for relaxed seating arrangements, ideal for conversation and relaxation. The fireplace provides a warm focal point for evenings at home. Note that the kitchen island flows into this space, allowing guest access for casual meals and time spent together. The wide glass doors open up to the gracious patio, with steps leading up to the well-appointed backyard and pool areas. Interconnected with the natural environment, the entryway to this residence features a beautiful living tree. Windows in the house also provide stunning views of the treetops, canyon, and woods. Spanish-style tiles and a stone inlay provides a warm feel to the second-story dining area, which includes built-in cabinetry, essential for storage. This dining area looks out onto the living room below. A kitchen with ample cabinetry and wrap-around shelves will delight any chef. The living room provides yet another venue for entertaining, with a second fireplace, room for a piano, and the benefit of two levels of extra light. With a third fireplace - and remarkable views of the canyon and surrounding property - this master suite will become your oasis. Enjoy easy access to a dressing area and modern bath with separate soaking tub and glass-walled shower. Includes his-and-hers sinks. Create your own exercise room, or an additional home office, in this side space with extra storage. Admire the lush greenery from the three guest bedrooms downstairs, with the possibility of turning one into an airy office space. A gorgeous second bath takes advantage of the high ceilings with a resort-style shower. Enjoy a shady patio space and the feeling of an endless vacation with gorgeous areas for swimming and relaxation. 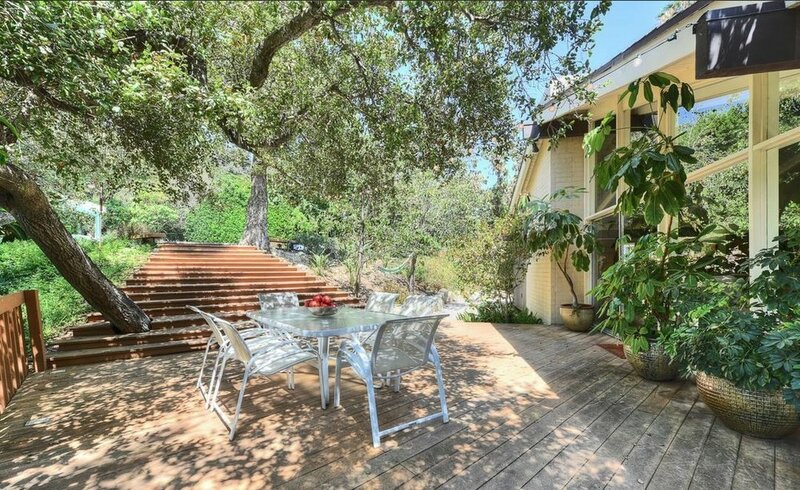 The secluded acre of property grants you the privacy to fully enjoy your time. Situated in Sierra Madre Villa, this home is close to a wealth of cultural venues, as well as the wondrous terrain of the natural world. Enjoy living in the best of both worlds.